This post is brought to you by TurboTax. While this post was sponsored by TurboTax, all content and opinions expressed here are strictly my own. 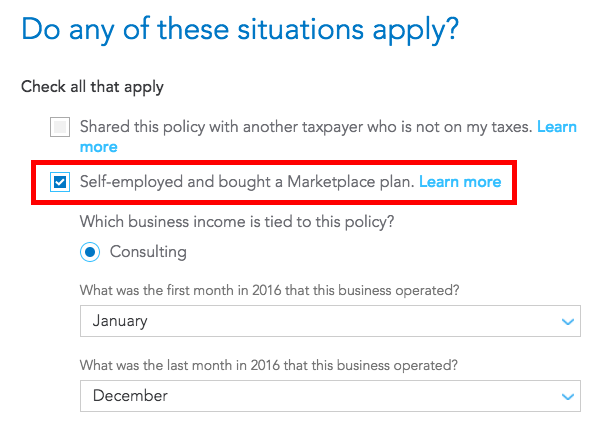 When you are self-employed, unless you still get health insurance through an employer, government, or private insurance you have to get it from the Health Insurance Marketplace. If your income qualifies for a subsidy or advanced premium tax credit, you can choose to take all of the subsidy to help you pay for health insurance. However, the advanced premium tax credit is only an estimate based on the income estimate you provided when you signed up. As self-employed people know, the actual income from self-employment can vary greatly from year to year. After the year is over, you have to square up and calculate the actual subsidy you really qualify for. If you had little growth during the past year, you may qualify for more subsidy. If you had a great year, you may have to pay back some of the advanced credit. If you’re self-employed, you may qualify for certain tax deductions as a result of paying for health care. If you qualify for a subsidy, the deduction may reduce your taxable income which may, in turn give you a bigger premium tax credit when you file your taxes. See IRS Guidance On Circular Reference in Obamacare Premium Subsidy and Deduction. When you are self-employed, you pay a “Self Employment Tax” on the net income that you earn from your own business, consisting of both the Social Security tax and the Medicare tax. The total of the two taxes is 15.3%, with 12.4% applying to the Social Security tax, while the remaining 2.9% is the Medicare tax. For 2016, the Social Security tax is required to be paid on the first $118,500 of net income from your business. The Medicare tax is required to be paid on all of your net income from your business, even beyond $118,500. Luckily, you don’t have to do the math: TurboTax Self-Employed (10% off for readers of this blog!) will handle all these calculations for you. You are single, self-employed, with no dependent. You signed up for health insurance in the Health Insurance Marketplace. The second lowest cost Silver plan was $600/month. The full unsubsidized premium for the plan you chose was $500/month. Based on your estimated income, you got a $150/month advance credit. You paid net $350/month. After deducting your business expenses, your income from self-employment was $45,000 for the year. You don’t have any other income or deductions. TurboTax online tax preparation package for the self-employed business owners, freelancers, and contractors is TurboTax Self-Employed. If you want to take advantage of the specific features for your self-employed income and expenses, including the self-employed health insurance deduction, choose or upgrade to TurboTax Self-Employed. 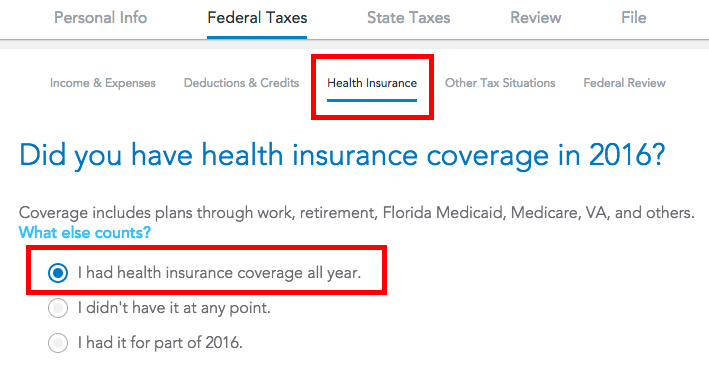 Under Federal Taxes -> Health Insurance, you are asked whether you had insurance all year. In our example we assume you had insurance all year. Next you are asked whether you bought insurance under ACA. You did. 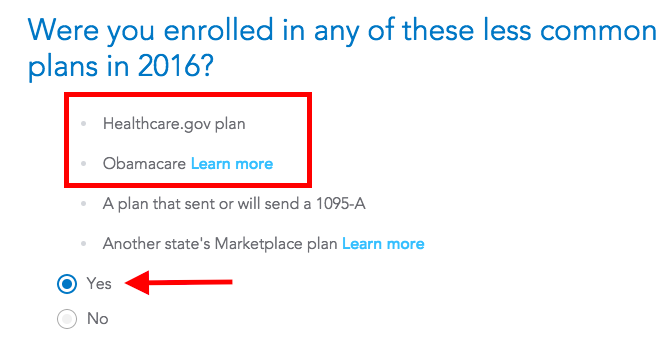 Confirm one more time it was a plan from ACA marketplace. Wait until you have the 1095-A from the marketplace. 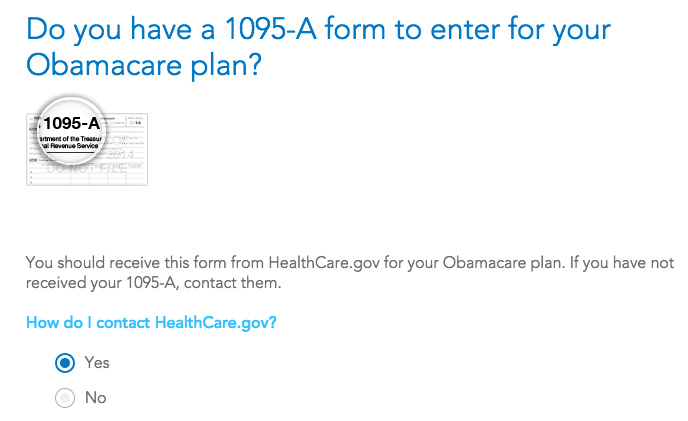 You can upload the 1095-A or you can type it in. We are typing it in. Enter the numbers from the 1095-A. Column A is the full monthly premium before any subsidy. Column B is the cost of the second lowest silver plan, which is used to calculate the actual amount of the subsidy. Column C is the subsidy you already took as an advance credit. If the numbers are the same for all months, click on Copy previous month a number of times to copy them down to the following month. Check the box to say you bought this policy when you were self-employed and during which months it applied. When you are done with the 1095-A, you see a summary. Now the computer crunches the numbers in a split second. You are eligible for more tax credit! Just to double check, click on Tools under My Account, then View Tax Summary. Click on Preview my 1040 on the top. Scroll down to line 29. It shows you are getting a $2,590 tax deduction for health insurance. Scroll down further to line 69. There you see the additional $1,610 tax credit. Remember you paid $350/month out of pocket after the $150 advance credit. $350/month * 12 = $4,200 for the year. Now you are getting $2,590 as a deduction and $1,610 as a tax credit. $2,590 + $1,610 = $4,200 you paid out of pocket. Without using software, if you just take $4,200 as a deduction, not only it’s wrong, but you will also short-change yourself. $1,610 as a tax credit is several times more valuable than $1,610 as a tax deduction. 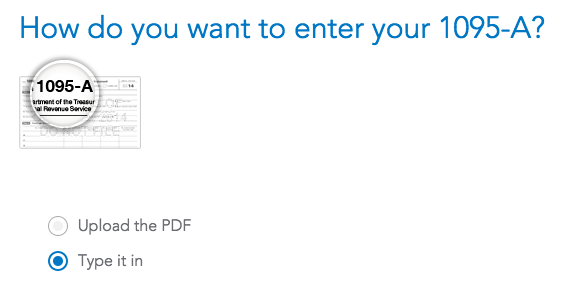 Over the years, I’ve published a number of blog posts like this one showing how to do certain things in TurboTax. Some readers asked questions when they were still not clear on what to do. This year, TurboTax has included TurboTax SmartLook™, which provides customers with priority access to a live, one-way video connection to a TurboTax expert and CPAs or Enrolled Agents. These experts specialize in self-employment taxes and can offer personalized, real-time answers to any tax questions – at no additional cost. Customers can also schedule an appointment with a tax expert at a time and date that works best for them. If at any point you are not sure how to answer the question or you are seeing unexpected results, you can request help from an expert by clicking on Contact on the top of the screen. The best part is expert help is free, at no additional charge, which is a great new feature. You are not alone when you use TurboTax online or its mobile app, so feel free to take advantage of any features TurboTax offers. The easy and simple software combined with live expert helps make using TurboTax Self-Employed a smart choice for any tax season. 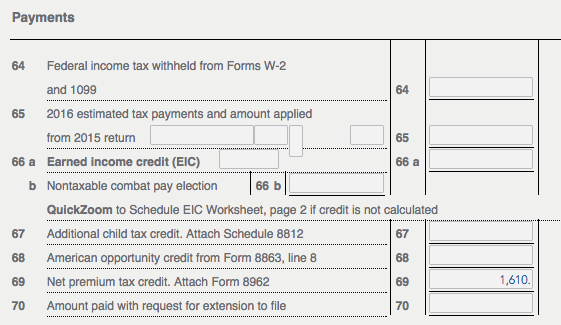 There is an issue with TurboTax Self-Employed: in many cases it gives a premium tax credit for self-employed individuals which is too small. Sometimes thousands of dollars too small. where the responder explains that the issue has been known to Turbo Tax for three years and has not been resolved. FWIW, I run my numbers long hand and they were within a few dollars of your webpage, and also with a few dollars of turbo tax. All to the good. The one I can’t get to jibe up this year is HR Block. Same numbers come out to a total disagreement of about 500 dollars. While both TT and yourself suggest 4010 is the area to be in, HRB gives another 300 or so in credits, throwing everything else off. Frustrating as heck! It seems like everyone should get basically the same answer, doesn’t it? Interesting. Yes, normally they should all be close. Do all three give a similar Line 29 deduction on the front page of your 1040? Or is HRB also giving you a larger deduction there than TT and the ACA calculator website? Also, could you provide the numbers you are plugging in on the website so I can try myself? And finally: are there any deductions on the front of your 1040 below line 29? Sorry about the delay, I’m happy to share. I’ve been trying to figure out the issue for about 3 weeks! To add to the conversation, Esmarttax gets a different number yet again but because their software allows you to see the forms I can look at them and at least form the opinion that they are not properly deducting/crediting the circular health fee/credit. They appear to be deducting the health costs to get the MAGI, calculating the credit and then giving that without going the next step to reduce the health insurance deduction. But at least I can figure that out! TT gives a 4018 subsidy, my excel gives 4015, yours says 4007. HR Block says 4260. (side note, hrb also give a notice when you reach this point that since you did the health deduction as well as IRAs, that you need to have one of their accountants review… who knows what those two things have to do with each other). That 260 pushes against everything else and amounts to about 500? less in taxes since it lowers my AGI in a way that inflates my savers credit beyond the 800 I am barely making now. I’ve used HRB for years and I won’t rule out user error… but something weird is going on!